The Man Who Signed His Name 'A. Lincoln' Drawing on recently discovered letters and photographs, historian Ronald C. White offers a new, highly praised biography of America's 16th president. Did Lincoln Write His Own Speeches? 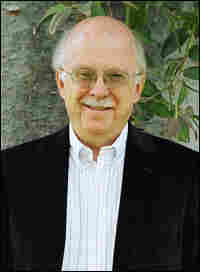 Ronald C. White Jr. loves the language of Abraham Lincoln. Lincoln's words, says White, are "strangely contemporary" and still often quoted. President Barack Obama is among the many who have drawn inspiration from Lincoln's speeches and writing. Obama's fascination with Lincoln is one reason the 16th president has been getting so much attention lately. 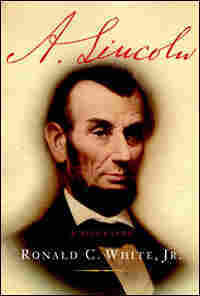 This month also marks the 200th anniversary of Lincoln's birth, and the market has been flooded with books about him. White's A. Lincoln has managed to emerge from the crowd to provide new insight into one of our nation's most admired presidents. In his two previous books on Lincoln, White focused on his rhetoric. But A. Lincoln is the story of his life. 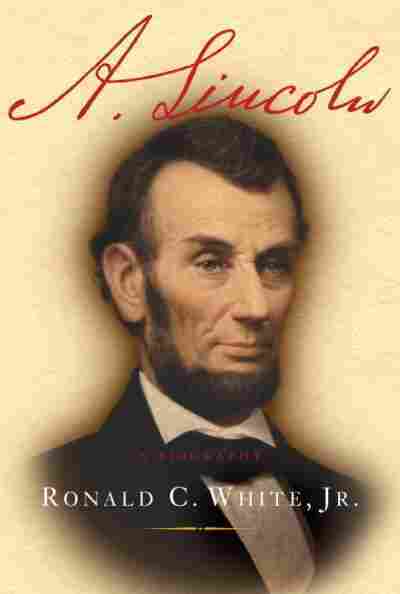 The title, White told one interviewer, invokes "the unpretentiousness of Lincoln." "A. Lincoln" was the way that Lincoln signed his name, and it was the only sign he had on the front of his house in Springfield, Ill.
"I want to portray him in all his humanity," White said. "He's not some marble god sitting in a memorial." The story of Lincoln's unlikely rise to power is almost mythical, and people around the world still find it compelling, White says. White explores Lincoln's troubled marriage to Mary, the deaths of two of their sons, and his bouts with depression. But he also writes of Lincoln's well-known love for books and how they changed and shaped his life in so many ways. The author reveals that Lincoln kept a kind of diary, little more than scraps of paper he used to jot down notes which he would sometimes use in his speeches. This love of the written word is what made Lincoln such a powerful orator. His talent for speaking became widely known during the Lincoln-Douglas debates, and critics especially praise White's depiction of those events. The Miami Herald calls this section of the book "fast paced, almost thrilling and eerily resonant." This reading of A. Lincoln took place on Feb. 6, 2009 at the Politics and Prose bookstore in Washington, D.C. He signed his name "A. Lincoln." A visitor to Abraham Lincoln's Springfield, Illinois, home at Eighth and Jackson would find "A. Lincoln" in silvered Roman characters affixed to an octagonal black plate on the front door. All through his life, people sought to complete the A-to define Lincoln, to label or libel him. Immediately after his death and continuing to the present, Americans have tried to explain the nation's most revered president. A. Lincoln continues to fascinate us because he eludes simple definitions and final judgments. Tall, raw boned, and with an unruly shock of black hair, his appearance could not have been more different from that of George Washington and the other founding fathers. Walt Whitman, who saw the president regularly in Washington, D.C., wrote that Lincoln's face was "so awful ugly it becomes beautiful." But when Lincoln spoke, audiences forgot his appearance as they listened to his inspiring words. He is one of the few Americans whose life and words bridge time. Illinois senator Everett Dirksen said fifty years ago, "The first task of every politician is to get right with Lincoln." At critical moments in our nation's history, his eloquent words become contemporary. As a young man, he won the nickname "Honest Abe" when his store in New Salem, Illinois, "winked out." Rather than cut and run from his debts in the middle of the night, as was common on the frontier, he stayed and paid back what he called his "National Debt." His political opponents invented a long list of denunciations, ranging from "the Black Republican" to "the original gorilla" to "the dictator." His supporters crafted monikers of admiration: "Old Abe," affectionately attached to him while he was still a relatively young man, and the "Rail Splitter," to remind voters in the 1860 presidential campaign of his roots in what was then the Western frontier. During the Civil War, admiration became endearment when the soldiers he led as commander in chief called him "Father Abraham." After his controversial decision to sign the Emancipation Proclamation on New Year's Day 1863, grateful Americans, black and white, honored him with the title "the Great Emancipator." Each name became a signpost pointing to the ways Lincoln grew and changed through critical episodes in his life. Each was an attempt to define him, whether by characterization or caricature. Yet how did Lincoln define himself? He never kept a diary. He wrote three brief autobiographical statements, one pointedly in the third person. As the Lincolns prepared to leave for Washington in the winter of 1861, Mary Lincoln, to protect her privacy, burned her correspondence with her husband in the alley behind their Springfield home. In an age when one did not tell all, Lincoln seldom shared his innermost feelings in public. Lincoln's law partner, William Herndon, summed it up "He was the most shut-mouthed man that ever existed." Yet when Lincoln spoke, he offered some of the most inspiring words ever uttered on the meaning of America. Each generation of Americans rightfully demands a new engagement with the past. Fresh questions are raised out of contemporary experiences. Does he deserve the title "the Great Emancipator"? Was Lincoln a racist? Did he invent, as some have charged, the authoritarian, imperial presidency? How did Lincoln reshape the modern role of commander in chief? How are we to understand Mary Lincoln and their marriage? What were Lincoln's religious beliefs? How did he connect religion to politics? As we peel back each layer of Lincoln's life, these questions foster only more questions. Actually, Lincoln did keep a journal, but he never wrote in a single record book. What I call Lincoln's "diary" consists of hundreds of notes he composed for himself over his adult life. He recorded his ideas on scraps of paper, filing them in his top hat or his bottom desk drawer. He wrote them for his eyes only. These reflections bring into view a private Lincoln. They reveal a man of intellectual curiosity who was testing a wide range of ideas, puzzling out problems, constructing philosophical syllogisms, and sometimes disclosing his personal feelings. In these notes we find his evolving thoughts on slavery, his envy at the soaring career of Stephen Douglas, and the intellectual foundations of his Second Inaugural Address. Lincoln's moral integrity is the strong trunk from which all the branches of his life grew. His integrity has many roots-in the soil, in Shakespeare, and in the Bible. Ambition was present almost from the beginning, and he had to learn to prune this branch that it not grow out of proportion in his life. Often, when contemporary Americans try to trace an inspired idea or a shimmering truth about our national identity, again and again we find Lincoln's initials carved on some tree-AL-for he was there before us. Lincoln was always comfortable with ambiguity. In a private musing, he prefaced an affirmation, "I am almost ready to say this is probably true." The lawyer in Lincoln delighted in approaching a question or problem from as many sides as possible, helping him appreciate the views of others, even when those opinions opposed his own. In an alternative life, Lincoln might have enjoyed a career as an actor in the Shakespearean plays he loved. As a lawyer, he became a lead actor on the stages of the courthouses of the Eighth Judicial Circuit of central Illinois. As president, he was a skillful director of a diverse cast of characters, civilian and military, many of whom often tried to upstage him. Although his military experience was limited to a few months in the Black Hawk War of 1832, Lincoln would become the nation's first true commander in chief, defining and shaping that position into what it is today. Lincoln is the president who laughs with us. His winsome personality reveals itself in his self-deprecating humor. As a young lawyer and congressman, his satire could sting and hurt political foes, but later in life he demonstrated a more gentle sense of humor that traded on his keen sense of irony and paradox. During the Civil War, some politicians wondered how Lincoln could still laugh, but he appreciated that humor and tragedy, as portrayed in Shakespeare's plays, are always close companions. Recently, the question has been asked with renewed intensity: What did Lincoln really believe about slavery? Born in Kentucky, raised in Indiana, and becoming a politician in Illinois, Lincoln answered this question differently in his developing engagement with slavery throughout his life. One of the reasons he hated slavery was because it denied the American right to rise to African-Americans. In debates with Stephen Douglas and conversations with African-American leader Frederick Douglass, Lincoln understood that in doing battle with slavery, he was wrestling with the soul of America. Lincoln has often been portrayed as not religious, in part because he never joined a church. How to reconcile this, then, with the deep religious insights of his second inaugural address, given only weeks before his death? Where are the missing pieces in his spiritual odyssey? One clue is a private musing on the question of the activity of God in the Civil War found after his death by his young secretary, John Hay, in a bottom drawer of his desk. A second is a religious mentor in Washington who played a largely overlooked role in the story of Lincoln's evolving religious beliefs. Lincoln would have relished each new advance in the information revolution. Before the modern press conference, he became skilled at shaping public opinion by courting powerful newspaper editors. During the Civil War he learned how to reach a large audience through the writing of "public letters." He understood the potential of the chattering new magnetic telegraph, which allowed him to instantly communicate with generals in the field and become a hands-on commander in chief. In the last year and a half of his life, he surprised members of his cabinet by accepting a clearly secondary role in the dedication at Gettysburg, only to deliver a mere 272 words that stirred a nation. Even though we have no audio record of Lincoln's words, he still speaks to us through his expressive letters and his eloquent speeches. Lincoln may not have read the ancient Greek philosopher Aristotle's Treatise on Rhetoric, but he embodied his definition that ethos, or "integrity," is the key to persuasion. Even when Lincoln disappears in his speeches-as he does in the Gettysburg Address, never using the word "I"-they reveal the moral center of the man. Lincoln was conservative in temperament. As a young man he believed that the role of his generation was simply to "transmit" the values of the nation's founders. Over time he came to believe that each generation must redefine America in relation to the problems of its time. By the end of 1862, Lincoln would declare, "The dogmas of the quiet past are inadequate for the stormy present." In the last two and a half years of his life, Lincoln began to think in the future tense: "We must think anew, and act anew." However one decides to define Lincoln, whatever questions one brings to his story, his life and ideas are a prism to America's past as well as to her future. Excerpted from A. Lincoln by Ronald C. White, Jr. Copyright © 2009 by Ronald C. White, Jr.. Excerpted by permission of Random House Group, a division of Random House, Inc. All rights reserved. No part of this excerpt may be reproduced or reprinted without permission in writing from the publisher.